Imagine a Mars expedition on top of the Tharsis volcanoes or at the Vallis Marineris. What happens if one of the astronauts slips and breaks himself an arm or leg? How do you get him safely back to the base – especially if he has fallen into a steep canyon or a valley? This question is one of the main questions of AustroMars and we intended to prove that alpine mountaineering expertise as readily available in Austria can help in such cases where the difference between life and death is dependent on speed and quality of transport. 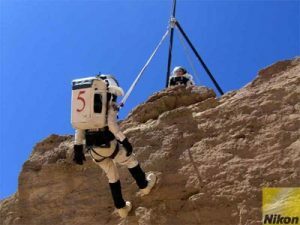 In our scenario an astronaut had fallen 12 m from a cliff and had been badly injured, suffering thereafter from a serious head injury (suspected subarachnoidal hemorragia, a bleeding in the brain, which might cause a slow loss of consciousness or even loss of breathing). This type of injury was reflected in our scenario by the fact that the patient was consciousness at the beginning and could even support the rescue operations, but falling into unconsciousness later on (by the way poor simulated patient was Alexander Soucek, the First Officer of AustroMars). When Alexander (simulated) fell from the cliff in a geological expedition, he landed in a canyon, where he had to be lifted up by a quickly erected bipod. Once this was set up, Gernot Grömer, our Health and Safety Officer, was lowered down to the patient. Gernot conducted a first patient assessment and initiated a treatment (mostly psychological support). Afterwards, Gernot attached Alexander, who was still conscious and cooperative to a carabiner, so that he could be lifted up into safety by a one-to-four linkage. The comrades pulling the rope were Christoph Kandler, the AustroMars Mission Specialist for planetary Sciences, Christian Hutsteiner, our Flight Engineer and Markus Spiss, the AustroMars Mission Specialist for Life Sciences. Because of Markus’ profession as mountaineer at the Tyrolean mountain rescue service, he orchestrated the whole rescue mission and acted also as EVA commander. Once Alexander was safe, Gernot followed and then the whole team built a stretcher and carried the patient to the ATV. Lying on the stomach, Alexander became unconscious (simulated only), but as his head was fixed by the ring there was no immediate danger of suffocation. Once at the ATV, the patient was fixed to prove that a safe transport would be possible. While 5/6 of the AustroMars flight crew were involved in the rescue operation, I acted as HabCom and had plenty of work in the Habitat in trying to set up a working internet connection. Because of its remote location, the MDRS relies on satellite communications for internet access. Most likely due to the heavy storm yesterday, the MDRS prime satellite dish on the roof of the Habitat got misaligned, so it didn’t communicate with the satellite anymore – the whole internet was therefore lost. Thankfully we had our own temporary satellite communication system installed and so I whirled in the morning through the whole Habitat in trying to set up the connection in such a way that every notebook and computer could be online all the time again. This was not as easy as I had thought at the beginning because the satellite terminal did not accept a router on the other side but only a computer. So I had to open our PC, install a second network card that was luckily available to share the internet with all the other computers. A broken patch cable proved to add some more thrill to the whole exercise, but after 2.5 hours and a lot of help by the experts of our Mission Control Center in Salzburg I had succeeded at last. From there on we could again have a normal contact with our MCC again. Once the rescue group was back again, Christian and I went to another short-duration engineering EVA to fix the problem with the defect WLAN router at repeater hill. Although we tried hard with DC/DC converters and voltage dividers we did not succeed at the end, so we took the WLAN router back into the MDRS for thorough checking. This WLAN was concluded with the test flight of the Aerobot. After two short flights, we had to cancel further trials, as a harder landing crashed a part of the structure (which we will fix overnight). A bigger concern is the missing camera signal from the black widow webcam, installed on the Aerobot. In the lab, shortly before the flight it had still worked, while outside it ceased operating – the reason for that (mis)behaviour is still unknown. So many issues, so few time on ones hands and only so many spare parts. That’s the typical set-up of dramas at the MDRS. 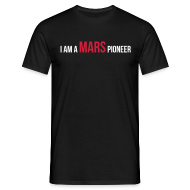 When comparing our problems with the ones that the astronauts had on the way to the Moon, the MIR, still have on the ISS and are likely to have on future Mars missions, I consider the MDRS an excellent test-bed to prove what human intellect and successful working together of crew and MCC can accomplish. This is for sure one of the best lessons that one can learn at the MDRS.